Yesterday the magazine finally arrived at my lair and what I found was really interesting. 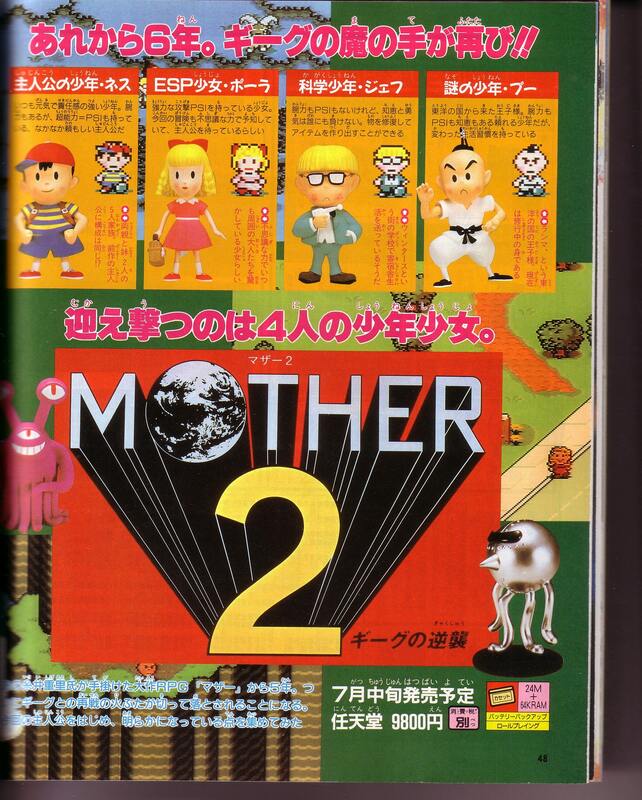 This is the June 3, 1994 issue, which places it only a few months before MOTHER 2’s release. 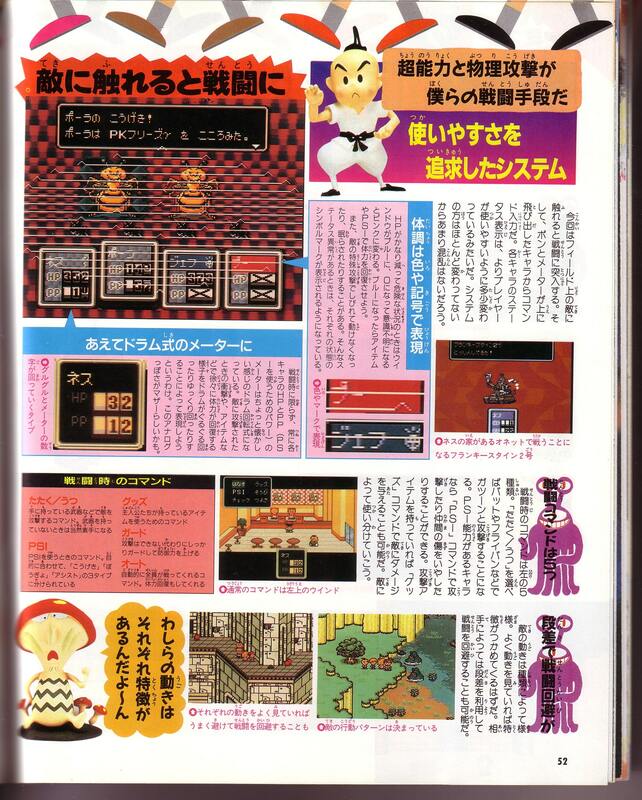 For some reason – probably just to have a ton of content to show – the MOTHER 2 preview in this issue features several pages of really old screenshots right alongside more recent screenshots. Some of these old screenshots we’ve seen before (here and here, for instance), but some are completely new to me! Pokey and King are following Ness… in broad daylight? For some reason the article writer also thinks Belch’s base is in the Deep Darkness. I haven’t fully read everything else, but if I do find anything else of interest I’ll update this post. 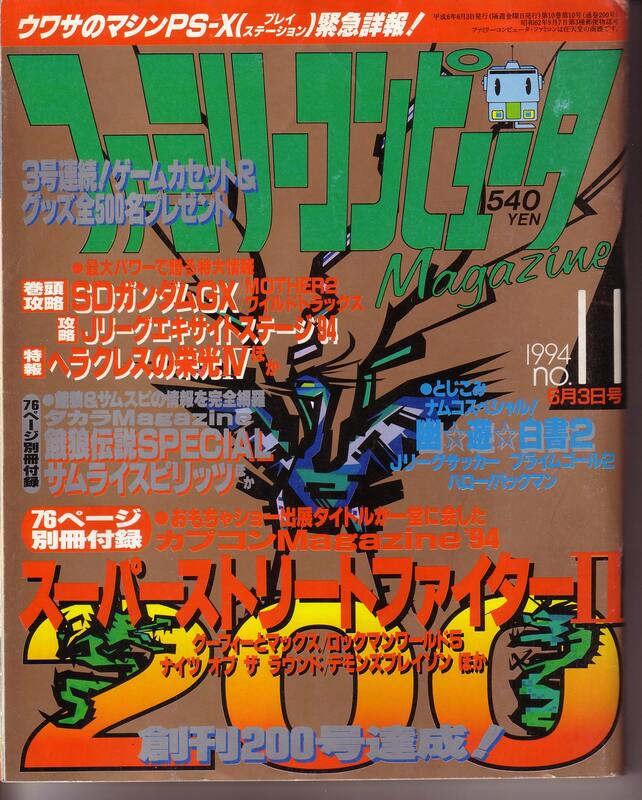 In the meantime, if you find anything else interesting in these scans, let me know in the comments! It’s fun pouring over these old screenshots and seeing what was changed before release. It makes me nostalgic for the days when magazines were the premiere source of gaming news. Waiting three seconds for your Google search to pan out somehow isn’t as a gratifying as waiting a month for your latest issue of EGM to arrive. They sure liked mooks, huh? It’s interesting to see that Pink Cloud Sanctuary looks like it’s blocked by some generic Dalaam guy instead of the rabbits, and this can’t have been too early in development because Dalaam isn’t snowy anymore. It makes me wonder if they went through the game near the end of development and spiced some stuff up to make it more humorous. He could just be a substitute sprite for the rabbits though, I suppose. And speaking of odd daylight scenes, it looks like Threed is using it’s “daylight” palette even when the zombies are running around. Yeah, the Dalaam one was really interesting. In Earthbound, the clouds have no temple or anything, but here the palace is on the clouds instead of the mountain, and it’s missing the elephant statues and stuff. Ice Sage: Like I mentioned, there’s a weird mixture of old pics and proper pics in there – there’s the old Dalaam and then a newer one, for example. It looks like Ness has his backpack in some screens but not others. 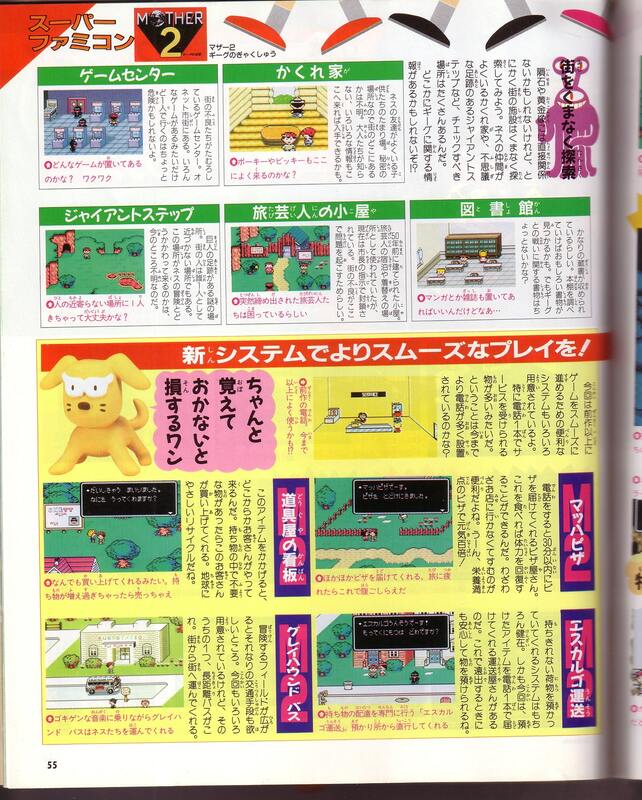 The yellow Threed pic is a really old one too, it’s been in a few other magazine scans I’ve posted. And that area is right before the Tenda cave. Except I’m fairly certain those enemies don’t spawn right there in the final version. I noticed something too. The supports on the bridge to Fourside are off kilter. Also that guy with a hat doesn’t have a hat. Well, he does. But he doesn’t in that one. – Apple Kid’s house isn’t as messy as it is in the final game. I think Orange Kid’s house is slightly different too, but I’m not sure. 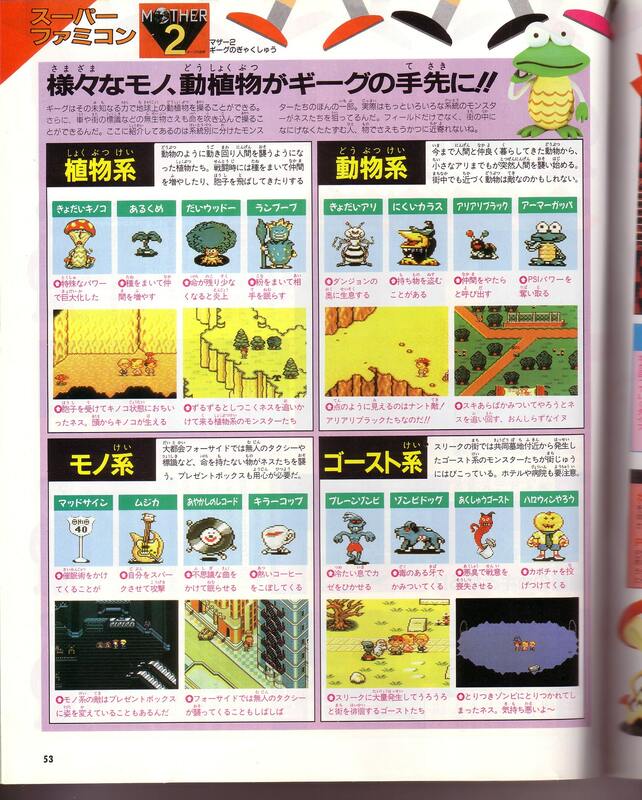 – The sixth page has a screenshot of the whole party fighting enemies from the mine, which is impossible because you don’t have Poo yet. There’s another oddity, though: if you look closely, you can see a random PSI Freeze animation frame behind the left Gigantic Ant. Not only that, but Jeff is diamondized as well, which isn’t possible at that time IIRC. Everything about that picture makes it obvious that it was made with some debug menu functions. There’s quite a few interesting things in those screenshots, and a few really stand out to me. -On the fourth page, the shot of Ness talking to Pokey inside Ness’s house. 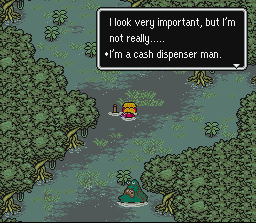 Even though Ness has his backpack, indicating this is a later shot, most of the tileset decorations look pretty primitive. The couches in particular look very similar to the ones in Mother 1. -Also on that page, the shot of Dalaam. The path layout is exactly the same, yet the cliff wall tiles are from the cave tileset. There’s also fewer clouds, and the clouds that are there are of a completely different style. 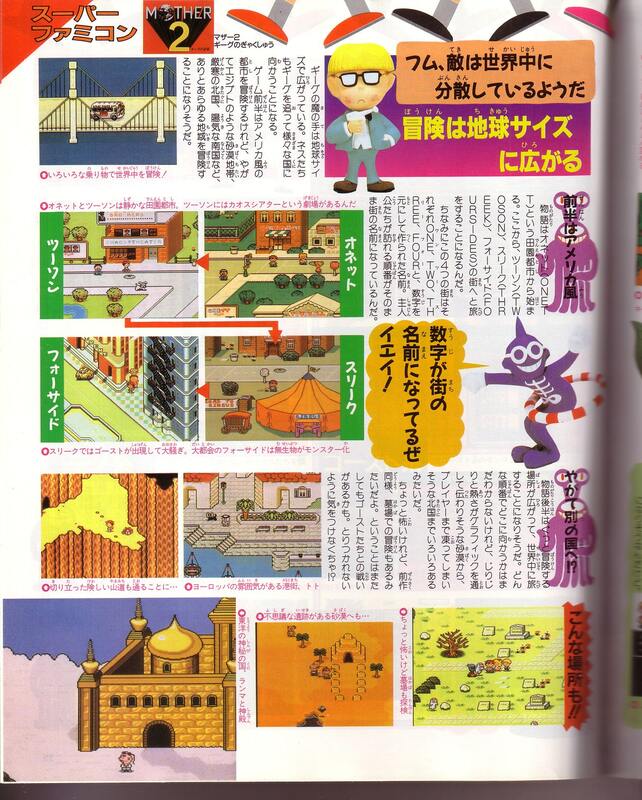 -On the third and ninth pages, the screenshots of Twoson show a very different layout for that town. This is interesting, since there’s some evidence in the final game that Twoson once had a different layout. 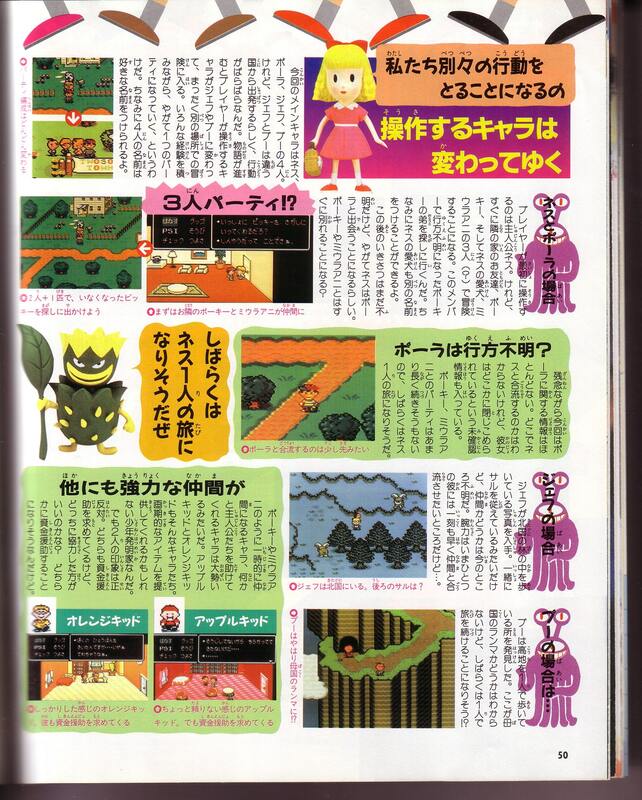 The battle text says that Paula is using Freeze gamma, which appears to be what’s behind the Gigantic Ant. However, the strange thing is that the foreground shows the Counter-PSI Unit’s animation occurring at the same time. 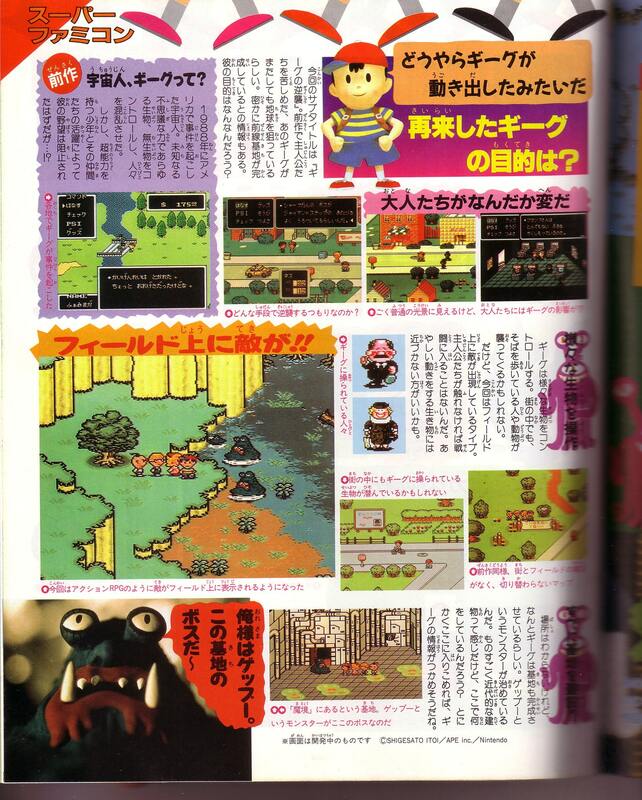 Hmm, interesting… On the last page, in the bottom-left image, Ness is in Twoson without a backpack. For comparison’s sake, you can see Ness with his backpack on in the image right above that one. I also find the Dalaam image on the 4th page rather interesting. In the final game, they replaced the man blocking the cave with a set of rabbit statues. 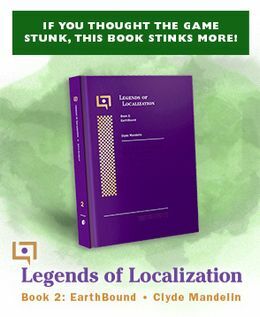 I guess they decided that Earthbound needed to be more zany? I enjoy stuff like these pictures. It’s always fun to connect the dots on how the game was developed.